Such pro-Armenian forces, as deputy chairman of the Russian State Duma Committee for CIS Affairs, Eurasian Integration and Relations with Compatriots Konstantin Zatulin can not influence the relations between Azerbaijan and Russia, which are developing at a high level, Azerbaijani MP, political analyst Elman Nasirov told Trend. “The relations between Azerbaijan and Russia irritate pro-Armenian forces,” he added. “There are very warm relations between the two peoples and the leaders of the countries,” Nasirov said. “Pro-Armenian forces, seeing this reality, began to fuss. One of them is Zatulin. We know that Zatulin is a tool in the hands of pro-Armenian forces. He always strives to damage the strategic relations between Azerbaijan and Russia." “Zatulin’s such an absurd position is not the position of Russia,” he said. “This is the opinion of a person like Zatulin who serves Armenian interests. 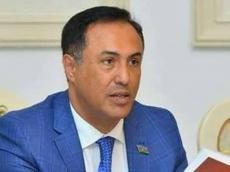 Despite this, the leadership of the State Duma of Russia must take measures in connection with such irresponsible behavior of Zatulin because these accusations contradict the Russia-Azerbaijan relations."